Well, today I finally pulled the plug on the Port Stockton Lincoln Highway ride. I was sad to see it go, but it just wasn't happening. I knew it months ago, but just wasn't able to drop the bone. 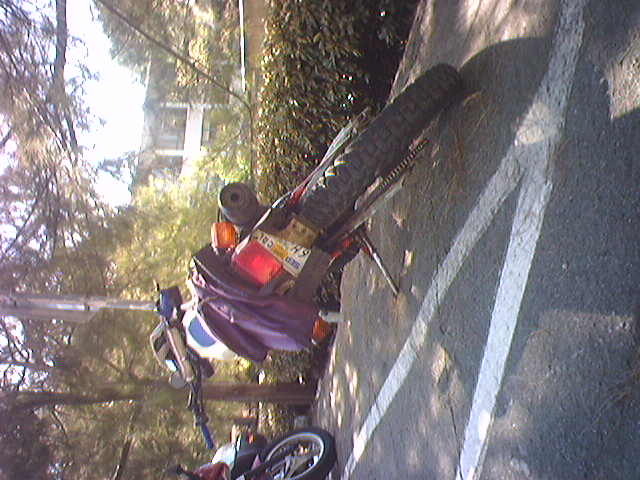 I even lost my ride card sometime after riding to Nevada in May. Exacerbating the situation, both Carolyn and Tony decided not to attempt the ride. So things got lonely. I just didn't have the motivation to finish until I realized the deadline was two weeks away. That led to a mad procrastination effort, as the rains and cold weather have come. Finally, this afternoon while riding across the 92 bridge I faced facts. Something had to give. That was it. days and I had hockey practice Halloween night. And even then, if I changed my mind, I could always wear my old Ren fair costume. Absolutely no reason to go to any trouble this year. So of course I now have one in my possession. I will probably wear it to school Friday to embarass myself. I discovered a whole new traffic hazard yesterday. Riding with a violent case of hiccups. (As if there's any other kind for me, really) However, I also found that at certain (and I'm sure well within the legal limits) speed, the air pressure against my chest was solid enough to cure them. For a while anyway. I got them three more times yesterday, including one time in a store. This attracted the manager, who had me sit down and tried to get me water. Do other people have this type of stuff happen to them? The winter rains have started. They slipped in with a little drizzle this weekend. But it's built up some momentum now. Tuesday is carpool day in the Delaney-Myles household we ride or drive based on common sense and economics. This morning we are in traffic as everybody slowly digs through racial memory to try to figure out how to try to drive in rain. At least Tony and I will grow old together, even if we do so before we make it to work. Ok. I know I park with students and that usually means young. And young generally means 'didn't quite think it through.' 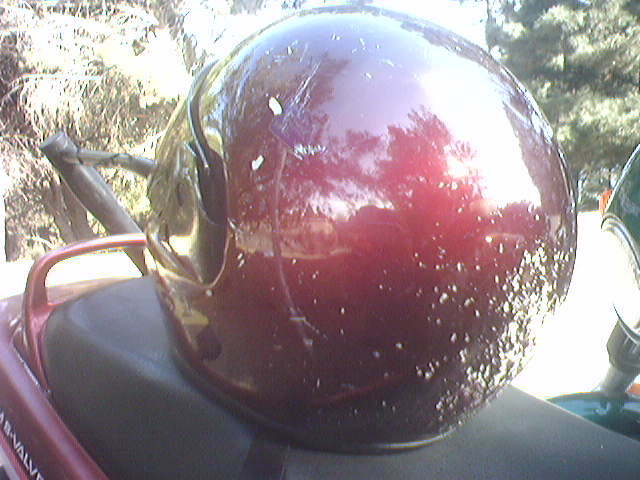 But, ummm, I think it's time for a new helmet. The best park is its locked with a huge-honkin' (TM) U-lock. 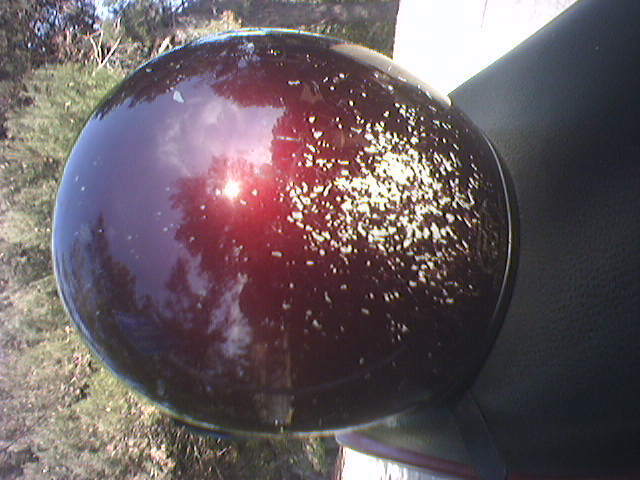 Who is going to steal this helmet??? How Do They Kick The Elk Out At Night? Not a terribly well posed picture. 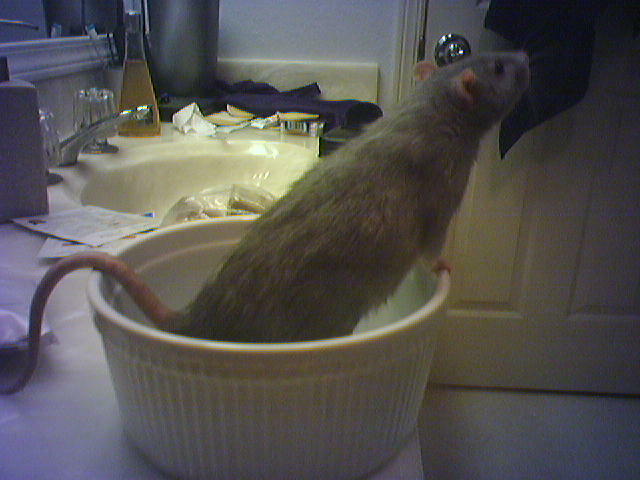 Yes, that is one of my Rattie Boyz (TM) in a souffle pot. This is because that is what I was imagining. See, it was rat cage night. And while doing Muffin's cage, generally helped along by Muffin himself, I accidentally grabbed pear scented soap. To compound matters, the guest tub wasn't draining right and I had the water on too hot creating this massive steam cloud. Say what you want about the evil beast, but this is probably the only mutinational I appreciate. Why? They built their empire by having the basics in place. Air conditioning, space, decent chairs and enough locations to triangulate position by. Who needs GPS? 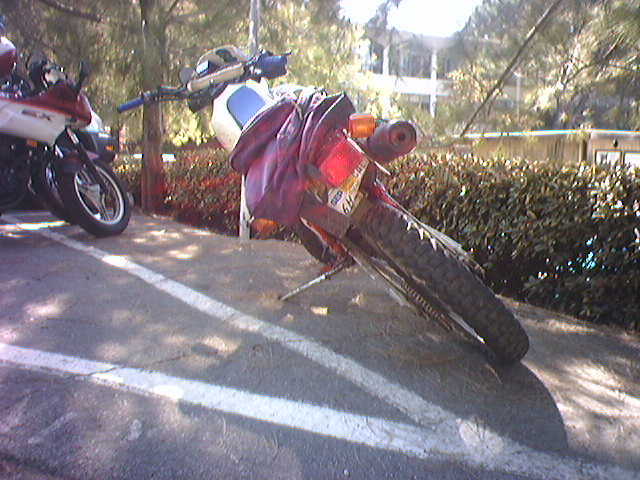 Unfortunately, it was also the site of the SECOND person in five minutes to use the ultimate biker cliche on me while I was innocently minding my own biz, standing in line and obsessing about java. "Aren't you hot in that?" Still irked by the last go round with this one, I stared at him a second. My special 'don't you want to reconsider what you've just said' stare. It usually works and I figured he would realize what a stupid question it was. Nope. Blithely onward. So I snapped. I smiled kindly and began to tell him *exactly* how hot it was in a riding suit. In great detail. With all sorts of random sequiters involved. The worst torture of all, a nice person. Who won't...shut...up. Started off with; "Yes. Of course I am." And went from there. Talked the poor guy's ear to a nub about biking in heat, biking in general and Triumphs in particular. It was fun watching him make those step moves of a person desperate to run for the door. A lifetime of psychology and retail have turned me into an evil person. I like to think I use my powers for the greater good. Because I GUARANTEE he will never ask another biker that question again. Yes, the parking lot is level. The camera angle doesn't make that clear, so tilt your head just a bit for full effect.